Bed was comfy and big! Liked the array of food at breakfast. Breakfast was nice. Also we enjoyed Christmas dinner. reception staff specially old people is very very and very bad. i recommend to be replaced as they are spoiling the name of the hotel. All facilities were excellent. The variety of dining venues was very good; staff were friendly and helpful; room was excellent and clean, with great views. A real "you're welcome" feeling about the property. The hotel was brilliant value for money. Rooms are a bit small but had everything you need for a comfortable stay. Nice pool area as well as a private beach and plenty of restaurants/bars to choose from. Super comfy. Beautiful inside and out. Good free valet service. Nice little beach/pool areas, good enough and what you expect from a fake beach in a dessert! I liked that the pool and the beach were very close to each other. The atmosphere was brilliant. As we wanted vegetarian food after requesting to Chef , he made special vegetarian food for us which was very tasty. They didn’t replace the towels and not dry bathroom , the sheets not cleaned , dust in room, the spa is old and very bad , stuf in spa are rude , i trued to make massage and they always saying fully booked . The only good thing is the location infront of see . I think this hotel is not match with sheraton and UAE hotels standard . 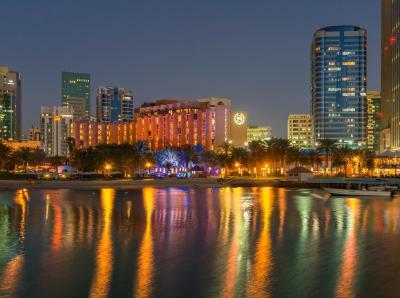 Sheraton Abu Dhabi Hotel & Resort This rating is a reflection of how the property compares to the industry standard when it comes to price, facilities and services available. It's based on a self-evaluation by the property. Use this rating to help choose your stay! 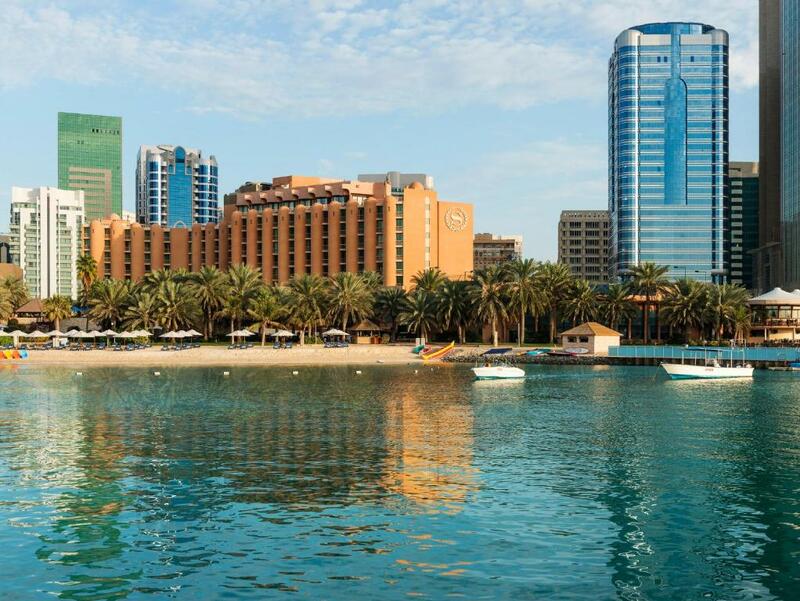 This 5-star hotel in Abu Dhabi city center is located on a private beach within walking distance of business and shopping districts. 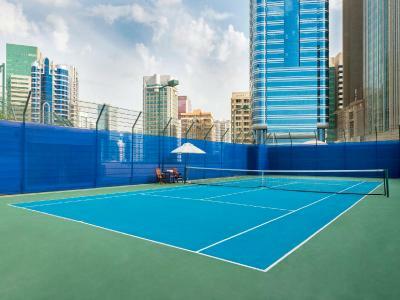 It has outdoor pools, a gym and 12 food outlets. 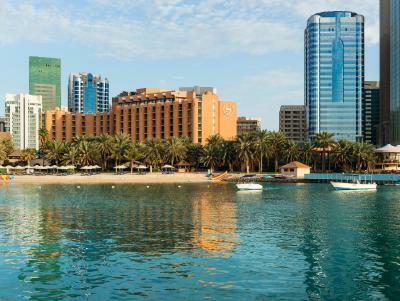 When would you like to stay at Sheraton Abu Dhabi Hotel & Resort? Featuring a city view, this modern fitted room with traditional furnishings, a large marble bathroom and a work desk. It has free basic Wi-Fi. Overlooking the lush gardens and pool, this modern room has traditional furnishings and a large marble bathroom. - Access to the club lounge with all day snacks 10 AM to 8 PM and afternoon appetizers with selected drinks from 6 to 8 PM. Featuring a resort view, this modern fitted room with traditional furnishings, a large marble bathroom and a work desk. This room has a spacious, open-plan living area. 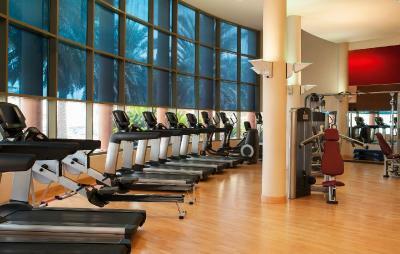 It includes complimentary daily breakfast and access to the hotel’s club lounge. This spacious room has an intimate dining table for two with a contemporary design using Italian marble and wood. On the highest floor, this suite is polished with marble floors, topped with hand-woven carpets. This suite has a balcony, air conditioning and minibar. The spacious one-bedroom layout extends to a separate private dining room. It also has a spacious kitchen, spacious storage space and a connecting maids room. This suite has a balcony, minibar and satellite TV. This 2-bedroom suite has an elegant decor. This family room has a balcony, mini-bar and bathrobe. - Unlimited access to both parks (one park per day) for guests staying two nights or more. This suite has a balcony, executive lounge access and mini-bar.